Stack Exchange will soon be shipping custom water bottles to moderators and users with sufficient reputation. We haven't yet finalized the design for the bottles, in particular, the tagline printed for all to see while you proudly ride, repair or rehydrate. 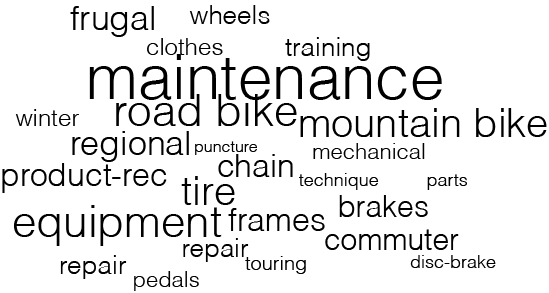 We are looking for a phrase or two that is short, catchy, bike-centric, and in-line with the philosophy of Stack Exchange. The tagline should say, in some way, that you can ask your bike questions or offer your bike wisdom here. Please provide your ideas as an answer to this meta post. Users who provide ideas used in the final design will receive a free Stack water bottle, of course. Any suggested improvements? Chime in and we'll settle on a final bottle design that the mods OK next week. Also, what volume do you prefer: 22 oz. (top) or 26 oz.? Bicycles: The answer to so many questions. Let's go for something a little more... provocative? Maybe it isn't necessary that we get the Q/A-concept across--this isn't a final slogan for the site, just a catchy phrase for a slick water bottle. I think it's most important that we pique interest in those who don't know what SE is. Ride hard. Never hit a paywall. A bike lane for your brain. Keep em coming! Let's try to settle on something by the end of this week. I'm sorry to be critical without having any better answer to propose, but I find the current suggestions yuck. The current suggestions try to be clever but aren't. I suggest that if we can't be clever then at least be plain. I like the tag cloud except that it's not (it's bigger than) a tag line. See also One short paragraph that describes this site for other more or less succinct descriptions of the site. This isn't a slogan, but instead, how about a tag cloud? It lets people know exactly what the site is about, paired with one of the slogans here about Q&A it'd be a pretty complete picture. This could be done so it fits in with Jin's design for the site. Maybe the folks at Stackapps could come up with a way to generate a proper cloud; this one is just a mockup. Edit: Here's the tag cloud again, with freiheit's changes. It's hard to beat Velominati Rule #5 for succinct catchiness. Just letting you know I submitted a final design for bottles to Specialized last week. I'm waiting on a mock-up and timeline for delivery. I'll let you know as soon as they're available. It's not too late to throw another tagline into the ring or add one to this answer that I did not include. Edit this post! Add more taglines! I'll get a final list up on Friday and we'll have a winner next week. We don't spin our wheels answering your questions. Can we have a play with 'solved' or 'solution' (rather than question and answer)? Please brainstorm with the meme! Thank-you. Over the years there have been very few compelling water bottles for retail sale. I don't know why they have to be so boring! At the retail level this is a problem when people ask for one specifically and you show them the 'efforts' on sale for them to say no thanks! They have a £5 burning in their pocket but there is nothing that just grabs them. Consequently I believe that a series of well designed water bottles will be well received. Hence my suggestion is for a bike bottle design competition. With the other competition on hold, we might be able to run with something of global appeal. We could put down a few pointers of what we are looking for as well as a few technical pointers - a limit on the colours, whether those colours can include hi-viz and printing accuracy. We don't need to tie the design down to anything to do with bicycles.se except that will have to appear in the design somewhere. Also the artwork can be whatever, not anything to do with the site graphics. Technical use of the design, e.g. ml/pint/mouthfuls measurements on the side, a chain stretch measurement guide, miles to km ready reckoner. You don't even get 'Cafe de Colombia'/'Coke' and other Tour de France bottle designs nowadays. 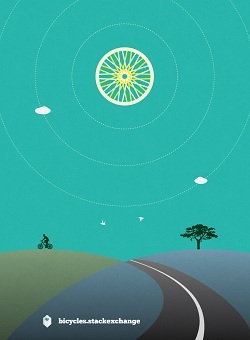 Design for Bicycles Stack Exchange. Let's have a contest for our birthday! Let's do a Bike To Work Month contest! Bicycles updated site theme is ready for testing!